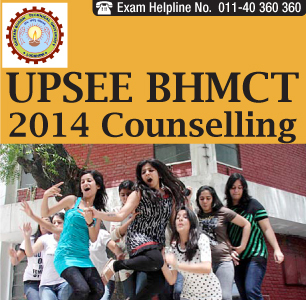 UPSEE BHMCT 2014 Counselling process/rounds of Uttar Pradesh State Entrance Examination BHMCT 2014 started on June 19, 2014. UPTU has notified that qualifying candidates have to report at the Uttar Pradesh Technical University, I.E.T. Campus, Sitapur Road, Lucknow. (UPTU) notified that qualifying candidates were required to report at the Uttar Pradesh Technical University, I.E.T. Campus, Sitapur Road, Lucknow or any designated document verification/counselling center from June 26, 2014 to July 3, 2014. The verification schedule can be attended by all qualified candidates (applied for any course) and they have to submit a bank draft of Rs 500/- as counselling fee. Candidates allotted a seat in Phase-I, Phase-II or Phase-III are required to particiapte in "Confirmation of Seats" event, which will be held from July 17-20, 2014. candiates are required to deposit confirmation Fee of Rs 15000 onlyin form of bank draft drawn in favor of “Finance Officer, UPTU, Lucknow” payable at city Branch at verification centre. UPSEE BHMCT 2014 Counselling involveed offering admissions to qualifying candidates for total of 1150 seats at 13 participating institutes located in Uttar Pradesh. Candidates deposited a bank draft of Rs. 500/- as counselling fee at the time of document verification process. The counselling fee is non-refundable. As per the existing U.P. Govt. Order, the tuition fee for NRI candidate was $7,000.00 (USD 7000) per year. The selected candidates deposited the fee in the allotted institute latest by June 22, 2014. UPSEE BHMCT 2014 qualifying candidates reported for document verification at the document verification on the assigned date. Depending on the state rank (combined general rank) of candidates, they will be called for counseling round at their respective verififcation/counseling centers. This was applicable for candidates belonging to reserved category. However, the advantage of their reserved category rank (in case they submit proper category reservation certificate) shall be provided at the time of allotment of seats. Verification of original documents was done at the document verification centre / counseling centers. The process involved verification of documents and information mentioned in it, like- qualifying examination, state of eligibility, category/ reservation certificate and weightage etc. of the candidate. Candidates got back their original documents once the document verification process was over. Candidates not carrying required original documents at document verification centre / counselling centre will not be considered for admission. Candidates were required to bring two separate account payee bank draft of Rs. 1000 as counselling fee (non-refundable) and bank draft of Rs. 5000 as an advance fee respectively, each in favour of "Finance Officer, U.P. Technical University, Lucknow" payable at Lucknow. What to carry during counseling rounds? Candidates, who secured admission during round deposited a 'part of college/ institute fee' in form of Bank draft of Rs. 15,000/- at respective document verification centres / counseling centers within three days from the date of issue of allotment/admission letter (inclusive the date of issue of allotment letter). Bank drafts must be drawn in favour of ‘Finance Officer, Uttar Pradesh Technical University, Lucknow’ payable at city branch of applicant’s counseling centre. The deposited part of college/institute fee (Rs. 15,000) is adjustable against total fee payable at institution if candidates take admission at allotted institute / university. Candidates failing to deposit the 'part of college/ institute fee’ within the said deadline will not be considered for admission and seat allotted to them will be cancelled.